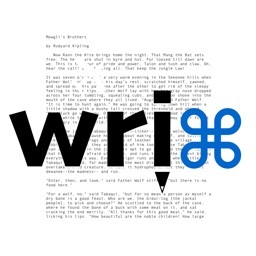 1Writer is a beautiful and streamlined text editor that comes packed with useful features. Customize. While 1Writer may look like a simple app on the surface, it packs in quite a punch when it comes to features. 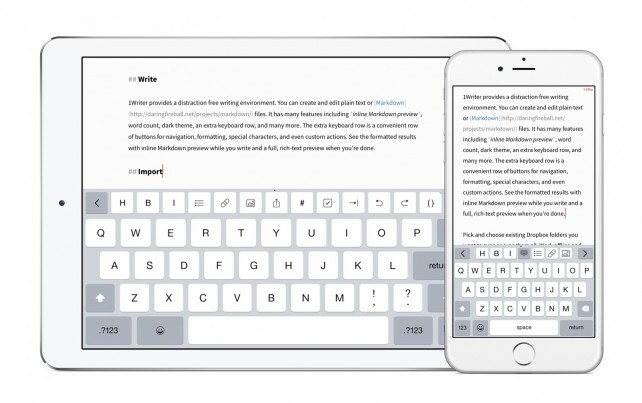 The settings in 1Writer allow users to customize the app to their liking, including themes and font styles, as well as other options that make the writing experience a whole lot better. You'll want to check out all of the available settings in 1Writer, because having the environment fit your needs is the most important thing to do before you actually start writing. Simple to use. You can access all of your iCloud and Dropbox files with this app. Just find what you need to edit, or add new files to a specific folder. 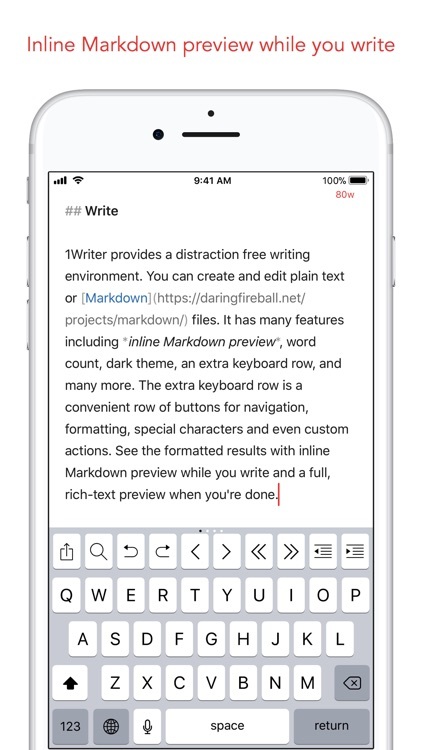 1Writer also has a convenient keyboard extension with multiple pages that are full of useful Markdown formatting shortcuts and special characters that you may need to use in your writing. No matter what it is you need, 1Writer has you covered. With 1Writer, users are greeted with a simple and clean interface that looks streamlined and easy-to-use. Users can pull in text files from their iCloud account or even just link specific Dropbox folders for full access to their existing files. 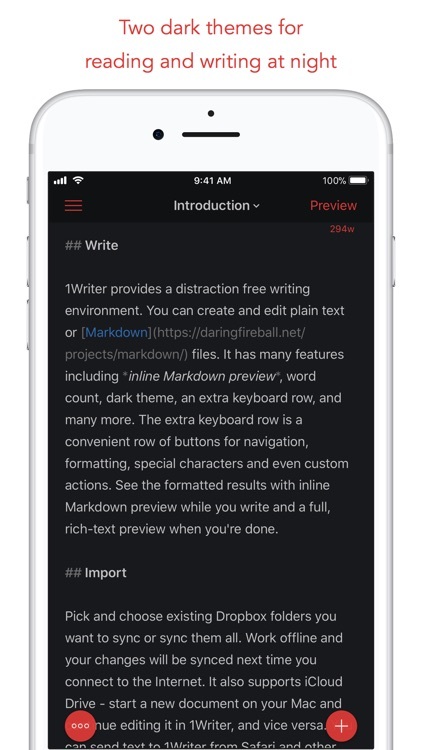 When you write, 1Writer will do live-previews for Markdown formatting, including inserting images. There is a full keyboard extension that has useful shortcuts for Markdown formatting and other things like special characters. 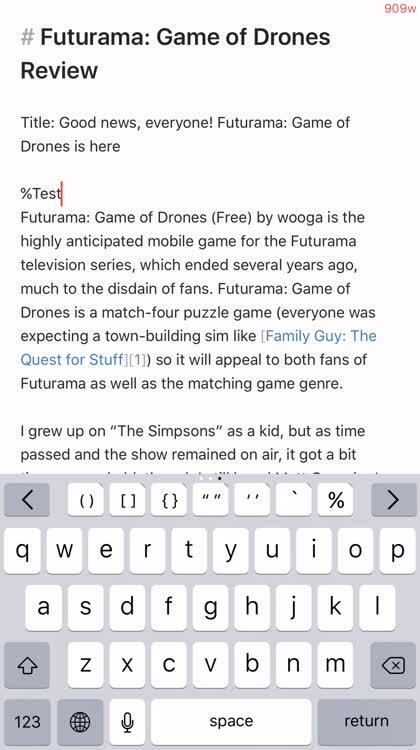 1Writer even has a built-in web browser so you can do research without having to leave the app, which is even better on the iPad. Once you’re done writing, there are many export options available to you if needed, so you can make sure that what you worked on gets published or seen properly. And on top of that, 1Writer allows full customization of the theme and fonts, so you can tweak it to your liking. 1Writer is a powerful text editor but it still retains a simplistic look and feel. We are impressed with the customizable aesthetics and love the functionality that it still manages to pack in the app. 1Writer combines all the basic text editing features you would expect with all the advanced features you will ever need. 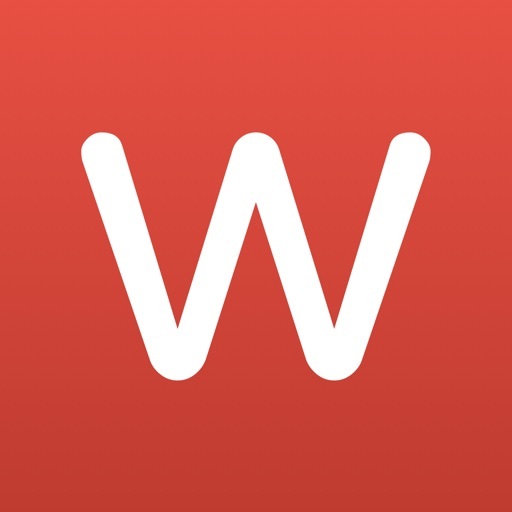 Use 1Writer to write, research, revise, and share your ideas with maximum efficiency. 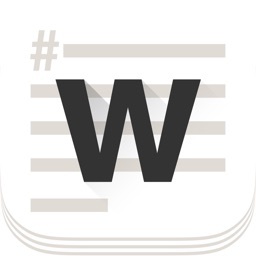 - Write :: generate and edit plain text or Markdown files. - Preview :: see the formatted results with Markdown syntax highlighting while you write and a full, rich-text preview when you're done. - Extended keyboard :: a convenient row of buttons for navigation, formatting, special characters (customizable--pick the characters you use the most). 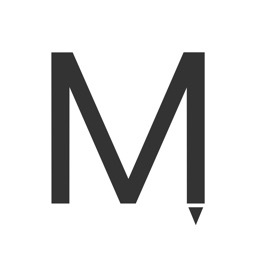 - Insert photo :: pick a photo or take a new one, and 1Writer will upload it to Dropbox and generate the Markdown-syntax to add it to your document--all in a single action! - Snippets :: TextExpander Touch support. - Custom URL actions :: insert a document template, encode a selection and replace the original text, look up synonyms and much more*. - Sync your existing Dropbox folders and documents. 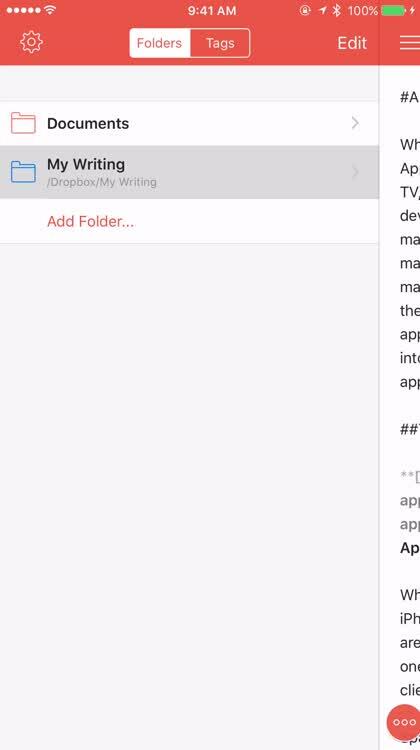 - Share extension :: send text to 1Writer from other apps. In Safari, the extension uses the current URL, page title and selected text to create a new document. - Create, append, prepend, or replace text directly from other apps using the 1Writer URL scheme. 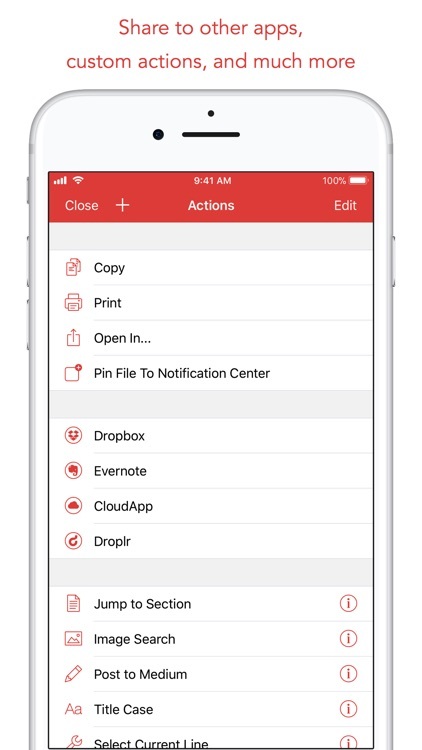 - CloudApp and Dropbox :: generate a link to share your document in plain text or PDF. - Evernote :: pick your notebook, add tags and turn a text selection or the entire document into a new, rich-text note. - Copy HTML :: put the formatted text for your document directly on the clipboard. - Custom actions :: open a web search, tweet a selection, save a series of items in a list and much more*. - 2 dark themes for more comfortable reading and writing at night. - Choose from 20 different fonts. - Bookmark and sync the Dropbox folders you want to have quick access to the sub-folders and documents you need. - Use a passcode or Touch ID/Face ID to protect the app from unauthorized users. - In-app web browser :: research, look up information without having to leave the app. 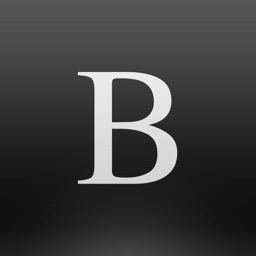 - Bookmarks :: create and access your favorite websites. - Save the current text selection to the clipboard in Markdown syntax. 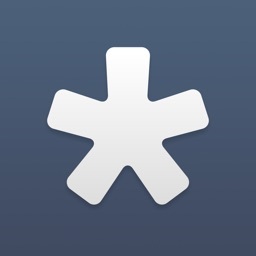 - 1Password support :: login to all your accounts using the 1Password extension. - Drag and drop support on iOS 11. - Open in Place support. - Search documents from Spotlight. - Find & replace within document. - Photo and PDF preview. - Today widget :: access your recent documents from the Notification Center or create a new document in one tap. - Checklist support :: create a list of things to do or topics to research, and easily check them off. - Full-text search and hashtag support :: search within a folder to find the document you need, and view related documents that have the same tag. * Compatible third-party apps include: Drafts, Terminology, Day One, Editorial, Phraseology, Byword, Ulysses, Tumblr, Chrome, Gmail, Launch Center Pro, Tweetbot, Dispatch, Due, Fantastical, Clear, OmniFocus, Things, 2Do and many more. The popular plain text and Markdown editor 1Writer has just been updated to version 2.0 with a bevy of new features and improvements. 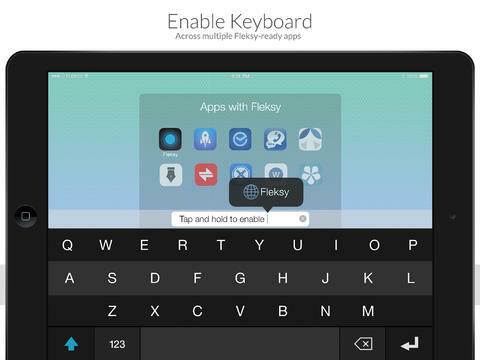 Fleksy, the predictive text input app, has received another new update.